I've been riding motorcycles for about a year and a half. It's one of those things that I kind of thought looked fun for, you know, about 40 years, but never truly imagined myself doing. But midlife crisis is a funny thing. And so it happened that a friend of ours was moving out of state and wasn't taking her motorcycle — a venerable 1985 Honda 450 Nighthawk — and my spontaneous notion to ask her if she wanted to sell it set in motion a chain of events that resulted in my own motorcycle, a safety class, a license, a new motorcycle, and many miles since then. These days, I commute more on the motorcycle (40 miles round trip) than I do in my car, rain or shine. The 450 was a classic starter bike — easy and fun to ride. So much so that it led to an interlude with a Yamaha 650 that is overall best forgotten, other than it was a valuable (in fact, expensive) lesson in the intricacies of carburetors and the difficulties in getting parts for old bikes. 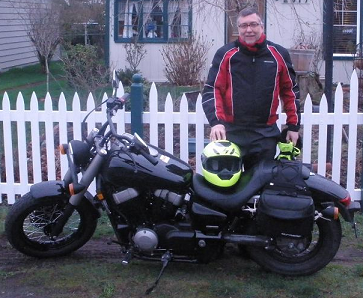 In this period and while son Zack and I were getting ourselves used to the whole world of motorcycles, we attended a motorcycle show here in Seattle, where I developed an instant crush on a 2010 Honda Phantom Shadow. The "shadow" part alludes to the color theme, which deemphasizes chrome in favor of black. (I believe this was the first in this vein, tho now all the manufacturers have variations of this matte-on-black scheme.) The bike has a vaguely retro look that hails back to the days of 1940s Harleys (think Marlon Brando in "The Wild One") and in dispensing with chrome is also meant to invoke a kind of bobber style. 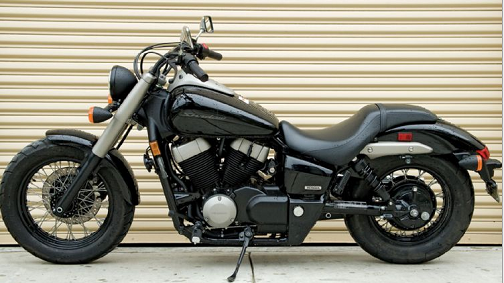 The thought of this bike percolated in my brain for a number of months until last February (2010), when a stretch of sunny weather sent me to the dealer, where the object of my motoric affection was on the sales floor, and before you could say "Put it on the AmEx card!" I was riding it home. An impulse purchase that was months in the making, so to speak. Every new car owner has this experience, but it was still a profound one: I would go to the garage and gaze at the bike, not entirely believing it was mine. It was, I think, the most beautiful thing I'd ever bought. Tom Wolfe once characterized the world of car customizers as a kind of sculpture, and so I felt (feel) about my bike. Beware of all enterprises that require new clothes, says Thoreau. Turns out, tho, that getting into motorcycles requires a certain level of accessorization. You need yer protective jacket, of course, and protective gloves, and boots, and of course a helmet (law says, hey). (For those who don't mind looking too butch, there's chaps. Not for me, thanks.) Rain gear, this being Seattle. Not to mention all the doodads you can hang off the bike itself, like saddle bags and whatnot. As you might imagine, all of this stuff is priced in keeping with the primary demographic for motorcycles, which is guys of a certain age and with a certain level of disposable income, if you get my drift. Learning to ride was an interesting experience; it was similar to learning to drive a car, with all the stress that entailed. Only with a less stable and more vulnerable vehicle. Truly I can't imagine trying to learn to ride a motorcycle without two areas of previous experience: a childhood spent on a bicycle, which gives a body a sense of how to maneuver a two-wheeler; and decades of driving a car, which had developed in me an instinctive feel for traffic flow and a reasonably reliable sense of what that guy in front of me (behind me, next to me) was likely to do. The idea of trying to learn to operate the vehicle, to keep a bike upright, and to monitor traffic, all at the same time — man, I could not have done it. Anyway, the bike. When I became smitten with the Phantom, I had done a bit of thinking about what I might in a bike, but it was somewhat speculative, given how little actual experience I had had. Size? Style? I had looked at a number of bikes, but had no clear idea. Until I met the Phantom. 750 cc engine. I had wanted something that would not strain to drive at freeway speeds. Turns out 750 is a good size for me at this stage. In the last year I've heard stories about people who were comparative newbies like me and bought bikes that were basically too big for them, hence didn't really end up enjoying motorcycling. A benefit of the "nervousness" aspect of my choice. Fuel injection. I had some bad experience with carburetors, and as it happens, the 2010 model was when Honda was introducing fuel injection across its line. Between the 750 cc's and the injection, I get a steady 50 mpg. Cruiser style. As cool as sportbikes (ninja-style "crotch rockets") look, I couldn't see myself spending hours leaned over, feet backward toward the pegs. 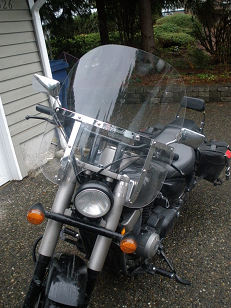 The 450 I learned on had pegs directly below the seat, meaning I rode upright; comfortable enough. I was slightly worried that the cruiser style (pegs forward) would be uncomfortable, but I've had absolutely no problem, even after riding for hours. Fat front tire. I had barely thought about this before I got the bike, but a fat front tire makes the front more stable on things like grooved pavement or seams in the concrete. More salve for the nervousness. Modest rake for the front fork. No Easy Rider fork for me. The longer the fork, the harder to turn. Windshield. I debated about this one, but finally got a removable SwitchBlade windshield. I'm happy with this now, but it took a couple of tries; the first one I got was too tall and became practically opaque in the rain. I now have one I can look over if I want to. There have been a few hiccups, of course. Part of the bike's look is that it has spoked wheels. Lovely, but that means no tubeless tires, which means that a flat tire is basically twice as expensive to fix. (Motorcycle mechanics don't patch tubes or tires; they replace them.) I still haven't completely sorted out how to carry stuff around with me. I have saddle bags, but they have limited capacity. I think that I'm about ready for my next level of proficiency class. In the meantime, I ride pretty much every chance I get. I will recount a few adventures in the fullness of time. Having a nurse for a mother probably didn't help. Nurse joke: "What do you call guys who ride motorcycles? Patients." In fact, I will never be a highly skilled motorcycle driver, which is ok with me. I just want to be a safe one.